Located near Pensacola on the gulf coast of the Florida panhandle, Panama City is a popular travel destination. 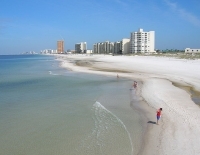 Set along 27 miles (43km) of white sand beaches, the town is a great place for families on holiday in Florida, with plenty of outdoor activities available in St Andrews State Park and Pine Log State Forest, and city attractions like the Panama City Visual Arts Center and Ripley's Believe It or Not! Museum. Panama City is usually a fairly quiet town, but comes alive each spring as thousands of students flock to the town for Spring Break. Concerts, parades, and other events are regular occurrences during this period. Travellers looking for peace and quiet should remember to avoid Panama City at this time.